DesignTechnica (link dead): The DSC-R1 took great photos—as a $999 10-megapixel camera should. I highly recommend it for anyone who doesn’t want to spend a small fortune on lenses or doesn’t have any to begin with. The camera isn’t perfect but none are—it is heavy and a wider focal length would be a nice bonus. It’s also not as fast as a D-SLR with slower frames-per-second rate and response time. Still it is an excellent camera–and one of the best that arrived in 2005. The good: Excellent image quality; an impressively flexible LCD screen that’s viewable from many angles; a sharp Zeiss lens; effective white-balancing features; a wide range of ISO sensitivity; quick performance. The bad: With most heavy components on the left side, the chunky body is somewhat off-balance; can’t shoot raw in burst mode; the in-camera review function magnifies to only 5X. The bottom line: If you don’t anticipate a need for multiple lenses–which many users won’t, given the crisp 24mm-to-120mm-equivalent lens with a maximum aperture of f/2.8–the Sony Cyber Shot DSC-R1 makes a worthy competitor to the dSLRs in its price range. 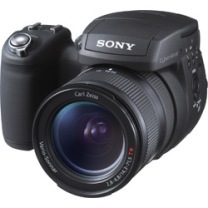 It’s a handy, versatile camera with excellent image quality. DigitalCameraInfo (link dead) reviews Cyber-shot R1 and concludes that Sony R1 will ultimately serve a small portion of consumers quite well: sightseers, realtors, and those looking for a casual high-performance imager without concern for speed. The quality rivals or surpasses many entry-level DSLR kits and will not disappoint those willing to invest $1,000 for it. Unfortunately, the sharp lens and clean images come at a significant expense. Users will have to sacrifice an optical viewfinder, lens interchangeability, autofocus performance, shooting speed (all around) and durability. While the R1 is not likely to appeal to those graduating from an FZ30 or other ultra zoom model, the camera offers a unique combination of exceptional Zeiss-branded glass and APS-C sized CMOS sensor unavailable on any other model.